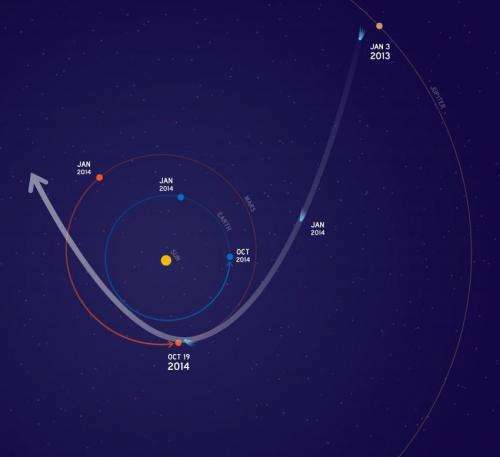 The comet's nucleus will miss Mars by about 82,000 miles (132,000 kilometers), shedding material hurtling at about 35 miles (56 kilometers) per second, relative to Mars and Mars-orbiting spacecraft. At that velocity, even the smallest particle—estimated to be about one-fiftieth of an inch (half a millimeter) across—could cause significant damage to a spacecraft. "Three expert teams have modeled this comet for NASA and provided forecasts for its flyby of Mars," explained Rich Zurek, chief scientist for the Mars Exploration Program at NASA's Jet Propulsion Laboratory in Pasadena, California. "The hazard is not an impact of the comet nucleus, but the trail of debris coming from it. Using constraints provided by Earth-based observations, the modeling results indicate that the hazard is not as great as first anticipated. Mars will be right at the edge of the debris cloud, so it might encounter some of the particles—or it might not." I agree, science uses S.I. Units, which are stated in Metric. Look America, I get it you want to keep the imperial system. Fine, but please stick to Standard International Units for science. Remember when you sent a space probe to Mars, yet one team was working in Metric, the other Imperial??? What happened???? Such a BRILLIANT space program, and yet such a silly mistake. Almost embarrassing. Perhaps the problem lies with the publication, as I suspect most of Science done in America uses SI Units anyway. So the problem may lie with the intended audience of the article. Anyway, at least BOTH units were in the article, but I agree with above, Metric first. I'm from the US and I still support metric first. Though I'm much more familiar with the imperial system (I grew up with it so I can't help it) I do try to put emphasis on the metric system whenever I can.